An unforgettable adventure through the full archipelago, passing through all 365 islands with a speedboat from Panama to Colombia, from Carti on the northern side of San Blas to Sapzurro in Colombia with no 2 day ocean crossing, traveling along the full length of the third biggest coral reef in the world and passing alongside one of the biggest untouched rainforests in the world! We are a fast boat alternative to the sailing boat from Panama to Cartagena. ABOUT THE TRIP We take you to islands no one else goes to, uninhabited islands with white sand beaches, coconut trees and turquoise waters, to snorkel untouched reefs & discover the magic of the Kuna culture in indigenous villages, visiting Colombian highlights, Sapzurro, Capurgana & La Miel. Look at the stars shining for you with a coconut rum on the beach, talk around a bonfire and let yourself free. 4 days/ 3 nights, boat transport through the San Blas islands on a motor boat. Snorkel gear. Great food (lobster when available). Accomodations - guests sleep in basic huts on Guna islands. Guna territory entrance fees, island fees. Immigration out of Panama. *Guests must bring their own water and beverages. 10 Great reasons to come with us Save money and see more. No 2 day ocean crossing = no seasickness & more island time. 90% of your time on the islands. 8 Hours on the boat in 4 days, the rest of the time on the islands. 5+ Islands – Sleep on the islands. Discover a magical indigenous culture. Snorkel the third biggest coral reef in the world. Wander and explore the islands at your own leisure. Bonfire – Beach party. Visit Colombian highlights – Sapzurro, Capurgana & La Miel. 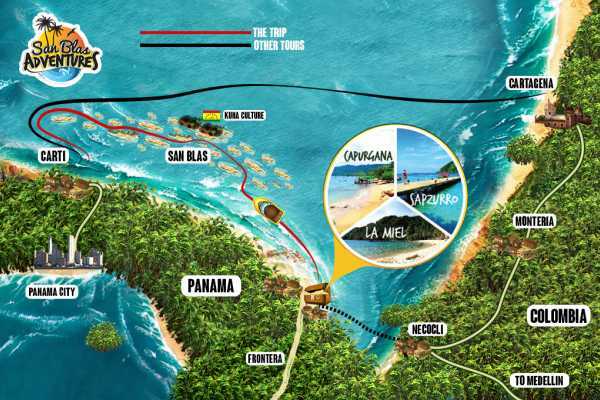 COST $399 Plus $30 ground transportation between Panama City and the port of Cart, San Blas. *Getting to Cartagena or Medellin will cost approximately $80 in boat and bus transport and accommodations (due to boat schedules guests will have to spend one night in Capurgana). .